My brother in law makes some really good coleslaw. It’s impressive to see him make it using just a knife instead of a shredder. Unfortunately it’s very popular and gets eaten fast. I’m always a little sad because I’ll want just one more serving… but the bowl will be empty and I’ll have to wait for the next family holiday gathering to get more. HAHA. YES, ELECTRICAL APPLIANCE WEEK. I don’t like coleslaw, but this would make it fun. let’s hope he doesn’t get his eyebrows stuck in that. Someone should try it and post it. I vote we get a whole “fun with fans” week. The losses of limbs would be delightful. I agree with Drake. Biff hasn’t gotten mutilated in a long time. I know how you can make sure there’s always enough coleslaw for you: kill everyone else in your family. This was the first thing I thought of when I read today’s comic. But yeah we have the same problem with my stepmom’s 7-layer Dip. IT’S INCREDIBLE, so it’s gone in like 10 minutes of course. Taken separately, cabbage is pretty lousy and mayo is just gross. However, mince them together and delicious goodness ensues. Biff finds it is better to turn the fan off before giving it regular maintenance. I always want to see what happened before or after your cartoons. This is a prime example. You’ve managed to be funny with the part of a joke that isn’t supposed to be funny. It leaves you on edge, and I like it. The things I like about the comic are (apart from the obvious reasons) are the way the crazy things in Biff’s world actually work most of the time (!!! ), the way that the comic is about one thing, and the author’s note is totally different and then we comment mostly on the note (XD) and that I bothered to read through all of the archives (I’m a lazy-PC-potato). …and if you buy our super coleslaw maker in the next 5 minutes, we’ll includes our MINI coleslaw maker at no extra charge. and if thats not enough to convince you, did we mention that they both keep you coooool on those hot summer days? so buy it now for 3 easy payments of 14.95. OH MY GOD!!! I HAVE TO TRY THAT!!! That looks like the most amazingly disastrous idea EVER!!! I’ll even buy a new fan just so that I can possibly eat the aftermath. But how do I catch it on the other side…..
A net of some description, or a trash bag with no bottom might help control the mess? I love coleslaw, the only problem is, there are like two types of it. There’s the good kind made with miraclewhip, and there’s that crappy kind that is made with some kind of manaise rip off that has no flavor. Sadly, when you order coleslaw with your meal at a restaurant you never know which one you’re going to get. The same goes for my grandma’s snickerdoodles. She only makes them during Christmas, but no matter how many she makes, they’re always gone within a week. It’s real aggravating, cause if I get to eat too many, someone in the family stares daggers at me until New Years, and if I don’t get enough, I’m the one staring daggers. Coleslaw is great. Although how your family feels about your brother in law’s coleslaw is exactly how my family feels about my Gran’s potato salad. I can just see those eyebrows getting caught in that fan…. Biffs pulling off an old cartoon gag. Why use a fan when you could rent a wood chipper? 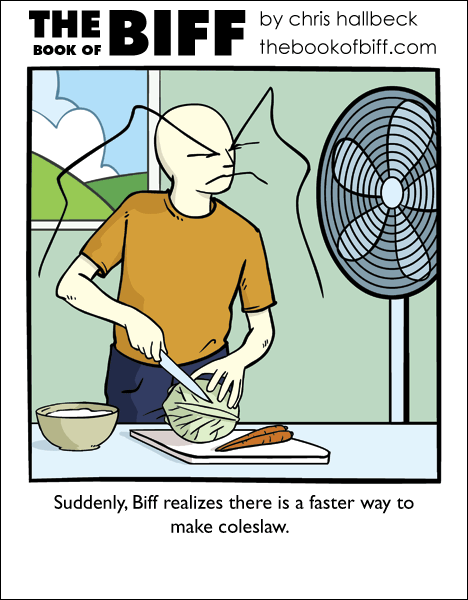 not a big fan of coleslaw but i would definatly throw a ball of lettuce in a heavy duty fan. confetti!